LAWRENCE -- Kansas' ever-enthusiastic basketball fans relayed a message loud and clear on Friday night: They are once again more than ready for hoops season to start. On Sept. 28 -- just over a month into college football season -- a throng of 16,300 packed Allen Fieldhouse not only to witness the spirited rap performance of 41-year-old former Alabama State basketball player Tauheed Epps (better known as 2 Chainz), but to watch the 2018-19 Jayhawks act, dance, play musical instruments (David McCormack on the drums with the pep band) and ultimately compete in a short 20-minute scrimmage at the 34th-annual Late Night in the Phog. "We tell players before we ever get 'em this is one of the biggest dreams of playing here," KU coach Bill Self said, speaking to the crowd just after 8 p.m. -- after the 2018 Final Four banner was unveiled in the northwest rafters, high above the student section. "Not many places in America can pull this off year after year after year," Self added of packing the building for the season-opening Late Night extravaganza. "We talk about decibel readings," 16th-year KU coach Self added amid thunderous applause, "give yourself a round of applause for being the best fans in the United States of America." Self -- he was dressed informally wearing a light blue collared shirt and black pants -- was impressed there was not a seat to be had in the tradition-rich building by the 6:30 p.m. Late Night start time. Some seats were occupied by former KU players (Nick Bradford, Sherron Collins, Jeff Hawkins, Elijah Johnson, Clay Young), others by the many recruits in town who strolled out of the northwest tunnel at 7:49 p.m. to take their seats behind the KU bench. Self, lead actor in a video that had him hunting for a coach's whistle in a car cluttered with Big 12 title trophies, Final Four trophies and championship rings, had the fans in the palm of his hand during a five-minute speech that preceded a dribbling and bicycle-riding relay race involving all the Jayhawk players. "This is a remarkably unique place as you know," Self told the fans, "one to be proud of. There's only one school that can boast the inventor of the game was our first coach." Self concluded a five-minute speech by saying: "It's going to be a great year. We're going to be good and maybe have a chance to be special. Everybody has a role to play and that includes you (fans). Rock Chalk Jayhawk," Self added, returning to his seat on the bench in front of the recruits. Jayhawks past and present took part Friday. Former KU guard Ryan Robertson appeared on the center video board from his hometown of St. Charles, Mo., and offered a message to the fans 10 minutes into the show. "My greatest memory of Late Night," Robertson said, "is Nick Bradford dancing to M.C. Hammer's, 'Can't Touch This.' 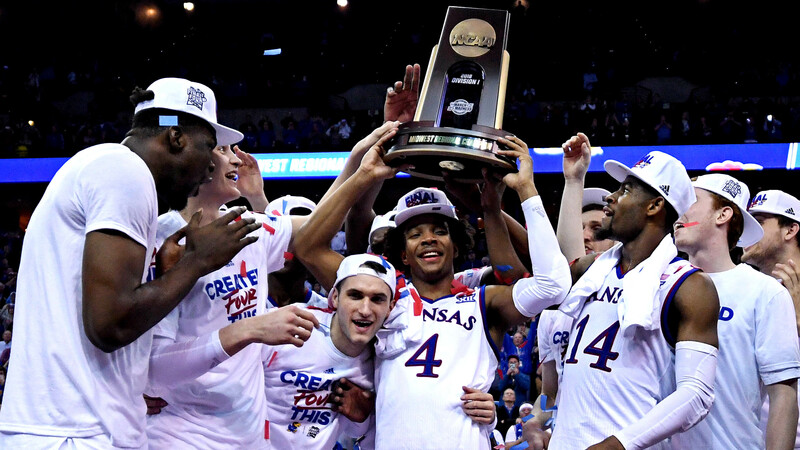 I wish I could be there," he added, to the cheers of fans viewing the videos of Robertson, and also ex-Jayhawk big men Joel Embiid and Cole Aldrich and guards Devontè Graham, Frank Mason and Ben McLemore. WATCH: Which current college hoops coach had the best game? The musical guest of the night -- 2 Chainz -- rapped with both KU's men's and women's teams dancing on the court. The fans stood for his rousing performance and lit their cell phones. He graciously thanked, "whoever invited me," and performed several numbers wearing a No. 2 KU jersey with 2 Chainz on the back. The recruits seemed to enjoy the event, also standing and dancing to the music of 2 Chainz. "I thought he was pretty cool," Self said of 2 Chainz. "He came in and talked to our team beforehand. That was nice. You can tell he likes ball. You know how you go to a high school game and sometimes at the end of the quarter a little kid comes out and shoots between quarters? He couldn't wait to shoot in front of everybody (as Jayhawks warmed up for scrimmage after his performance). He actually had a nice stroke," Self added, noting he would invite 2 Chainz to an actual game this season.